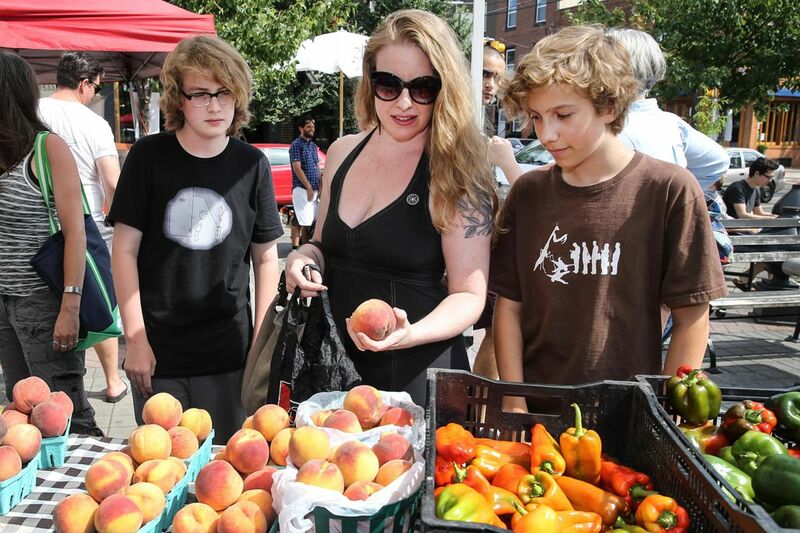 Jenn McCreary, 45, of South Philly, selects peaches with her twin teenage boys, Caleb (left) and Malcolm at the Farmer's Market at Passyunk Avenue and Tasker Street. We're in the midst of summer and it's a great time to focus on eating well. Many fruits and vegetables taste best during this time of year, and produce prices are often lower during the summer, too. Kids also have more free time and are looking for exciting activities. Here are some ideas to help you and your child have fun with food! Visit a pick-your-own farm. Visiting a farm with your kids and learning where our food comes from makes for a fun-filled summer adventure. When kids help pick their own fruits and vegetables, they are often excited to eat what they've picked. Pick-your-own fruits and veggies can also cost less per pound than at a grocery store. Pickyourown.org is a great website to help you locate farms near you. Plant a vegetable garden. Similar to picking their own vegetables, kids are usually more willing to try foods when they grow it themselves. It's not too late to plant a garden! Plant cool-season vegetables such as kale and cauliflower for a fall harvest. For next spring, easy-to-grow vegetables include tomato plants, green beans, or sugar snap peas. If you don't have garden space, try using containers — a cherry tomato plant in a pot is a fun way to start. Create smoothies that include fruits and vegetables. Does your child like frozen treats? Smoothies are a tasty way to enjoy fruits and vegetables and stay cool throughout the summer. Add your favorite fruits and veggies to the smoothie, and include milk or yogurt to provide key nutrients like calcium and Vitamin D for strong bones. Avoid ingredients with added sweeteners like ice cream, frozen juice concentrate, or canned fruit. Here's a recipe for a Groovy Green Smoothie, which is a kid and adult favorite. Smoothie popsicles can be a fun twist on traditional smoothies, especially for young kids. Try this refreshing strawberry and watermelon popsicle recipe made from 100 percent fresh fruit! Ask your kids to plan a meal with all five food groups. Start by explaining the five food groups to your kids: protein, grains, fruits, vegetables, and dairy. Ask them to create a meal for the family that includes foods from all five groups. To keep it exciting, give them grocery store ads and have them cut out pictures to glue on ChooseMyPlate.gov's coloring sheet. Keep an open mind and follow through by making what each of your kids plans. You may discover a new family favorite! Involve your kids as you make meals and snacks. Kids of all ages enjoy testing new recipes in the kitchen. Young kids can help with simple tasks such as tearing lettuce and helping set the table. Older kids may be able to prepare a recipe by themselves. Teaching your kids basic cooking techniques is a key skill and important to continuing good nutrition later in life. This summer, show your kids that healthy eating can be fun and tastes great. As they discover the recipes and routines they enjoy most, they might be eager to continue these habits even after summer is over! Beth Shaw, Ph.D., is the Milton Hershey School executive director of student support services.